I still remember seeing the vivid woodcuts of the human body looming out of the school history textbook for the first time, as clear as the sunlight that entered that dark room. The course title was ‘Medicine through Time’, a fascinating ramble through man’s attempts at healing the body that started at the Upper Palaeolithic and ended at the beginning of the NHS and modern medicine. The figures that loomed out were of course from Andreas Vesalius’s (1514-1564) anatomical book, ‘De Humani Corporis Fabrica Libre Septem‘ (1543), an illustrated manual of the human body in 7 books. Produced at a time of great learning, during the flourishing of the Renaissance, the books depicted the human body in vivid anatomical detail. Remarkably Vesalius published the first edition of the book at the age of 30, taking great pains to present the illustrations as accurately as possible. By using woodcuts throughout the text, with the odd use of intaglio (engraved copper plates), Vesalius cultivated great artists to help detail his anatomical and dissection findings. He had the text printed by Joannis Oporini in Basel, Switzerland, who was a printer of foremost talent in 16th century Europe. But where did Vesalius, as a anatomist and dissector, fit into anatomical history? Vesalius was born in Brussels, Belgium (then the Hapsburg Netherlands), in 1514 to a family of physicians and, under the directions of Jacques Dubois and Jean Fernel, studied anatomy and the theories of Galen at the University of Paris in 1533. He was forced to move his anatomical studies to Leuven, Netherlands, at the outbreak of war between the Holy Roman Empire and France in 1536, However he shortly moved to Padua, Italy, to complete his doctorate and took up the chair of surgery and anatomy after its completion. It is during this time that he conducted dissections on cadavers as a regular part of his student lessons as a primary learning tool, and promoted the use of directly observed descriptions during the dissections. This was a challenge to the established orthodoxy of Galen‘s (AD 126- 200) anatomical legacy. Galen studied the Hippocratic theory of pathology, and heavily promoted the theory of the 4 bodily humors and the idea of human temperaments. In particular Galen advanced the knowledge of human anatomy in many areas, including describing muscle tones and the functions of agonists and antagonists in the musculo-skeletal system, alongside major progressions in the understanding of circulatory, respiratory and nervous systems. Although Galen’s medical corpus was accepted as largely fact, his anatomical dissections were carried out on Barbary apes and pigs, as Imperial Rome in the 2nd century AD prohibited human cadaver dissection. One of the ‘muscle men’, displaying the superficial anatomy of the major muscles in the anterior view of the human body (Source: University of Glasgow). This led to several major inaccuracies in the work of Galen and in the understanding of the biology of the human body, and it wasn’t until Vesalius that certain views were corrected and amalgamated into Galen’s legacy. This included a number of corrections from Galen’s original works, such as recognising that the human jawbone (mandible) is one bone and not two, that women do not lack a rib compared to males (taken from the biblical idea), and that the interventricular septum of the heart is not porous as Galen advocated, alongside a plethora of other insights. This largely occurred because Vesalius advocated active learning during dissection of human cadavers (themselves often executed prisoners). 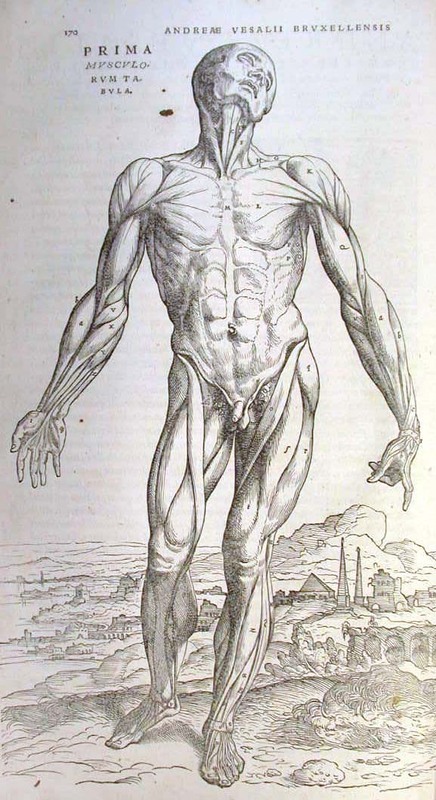 Importantly it should be noted that Vesalius work built upon work throughout the intervening centuries, particularly in the view of contemporary Renaissance artists and anatomists. His was not the first body of work focusing on the intricacies of the human body during this period, but it was one of the most detailed and finely executed, leading it to become an instant classic in his own lifetime. Although he improved Galen’s theory of circulation, it wasn’t until the English doctor William Harvey (1578-1657) accurately described the systematic circulation and properties of blood (1628). The University of Toronto has recently acquired a previously unknown and privately held 2nd edition copy of ‘De Human Corporis Fabrica’, and it is making the book accessible for researchers to study the text itself at the Thomas Fisher Rare Book Library. Remarkably the unknown edition includes annotations likely made by Vesalius himself, notes where he has corrected the printed text or made notes regarding what to include in the next printed edition of the book, which unfortunately was never printed. This typifies the character and nature of Vesalius as a dissector and researcher, but it also helps highlight the nature of science itself, how through the investigation of previous studies can inform future work and rectify mistakes or misunderstandings. In particular is also raises the subject and value of comparative anatomy between species, of homology, of the similarities and differences between mammals. Perhaps gruesomely, a human skin bound edition of the book survives and currently resides at Brown University. The practice of human skin binding is known as ‘Anthropodermic Bibliopegy’ and, as Wikipedia points out, dates back till at least the 17th century.